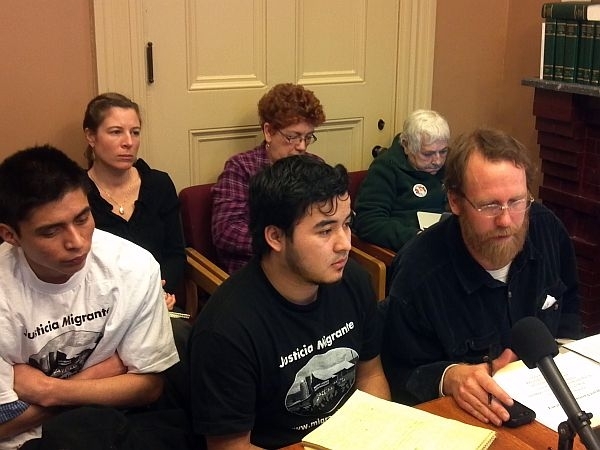 (Host) Immigrant farmworkers are asking lawmakers for a form of state identification that they say will ease their isolation on the farm and help them qualify for state programs. As VPR’s John Dillon reports, their ultimate goal is to be eligible for a Vermont driver’s license. (Dillon) The Senate Agriculture Committee rarely takes testimony in Spanish. But these days, 1,500 or so Hispanic farmworkers help keep Vermont dairy farms in business. That’s a point farmworker Danilo Lopez made. His comments were translated by Brendan O’Neill of the group Migrant Justice. (Lopez) (In Spanish) "So with this new law we just want to be recognized as part of Vermont. We are a part of Vermont. We contribute to Vermont and we want to be recognized as such." (Dillon) As Lopez spoke, a half dozen farmworkers crowded around him in the small committee room. The workers say they live in isolation and in the shadows. They say they’re often afraid to travel to see friends, get groceries or go to church because they could get stopped and deported. Lopez said Hispanic farmworkers need some form of documentation that would allow them to move more freely, and qualify for state programs. (Lopez) "The only thing we’re asking for is rights, access to programs and to be recognized as part of Vermont." (Dillon) The workers ultimately hope to be able to get a state driver’s license. Addison farmer Rob Hunt supports the license idea. He says workers sometimes get charged $50 just to get a ride to buy groceries. He says most farmers treat their workers well. But he says the fact the workers are undocumented makes it hard for them to speak out of they’re mistreated. (Hunt) "The idea of the driver’s license is the comfort level of the people and the ability to be mobile. And not only for convenience, but also I guess for the civil rights of the individual. They cannot demand their civil rights because they’re stuck." (Dillon) Essex-Orleans Democrat Bobby Starr is a longtime member of the Senate Agriculture Committee. He says the state ID is needed because federal immigration reform has failed. (Starr) "This is probably a 10 year deal in Washington that should be a 10 month deal to get it resolved. So at least the people that come to Vermont to work hopefully could move around Vermont freely." (Dillon) Governor Peter Shumlin said he supports the state ID, but he stopped short of endorsing a driver’s license for the farmworkers.